Summary: Amateur film of new housing developments across the borough of Hackney including terrace housing and estates of low-rise flats. Description: New housing developments across the borough of Hackney including terrace housing and estates of low-rise flats. Shots of Rendlesham House, on the corner of Rendlesham Road and Maury Road (E5). An unidentified new two storey block of flats positioned among terraced houses. A three storey block of flats on the corner of Chatsworth Road and Mildenhall Road and views out towards South Mill Fields. An unidentified new two storey block of flats positioned among terraced house, a man on a ladder repairs the roof of a ground floor bay on a neighbouring terraced house. Views of the Chatsworth Estate, including a shot of the corner of Chatsworth Road and Lockhurst Street. Views over the estate including the chimney and buildings of Millfields Power Station. Shots of Banister House, Homerton including the five storey blocks and a children's playground. A high angle view from the window of a flat across the back gardens of houses in Homerton Grove, with Homerton Branch Library (now Chats Palace Arts Centre), the tower of St Barnabas Church and the Nisbet House estate all visible. Shots from the other side of Banister House viewed from Homerton High Street by the junction of Digby Road. Views from a balcony of the estate grounds including the children's playground and of the rear of surrounding terrace houses including ramshackle yards with outside toilets. Shots of bungalows on the Somerton Estate with elderly residents on the street outside. A five storey block of flats on Jessam Avenue, part of the Lea View House estate. A view of the corner of Upper Clapton Road and Jessam Avenue, with overhead tram lines visible. Lea View Estate blocks in background while in the foreground a milkman pulls a milk trolley for United Dairies. Views of four storey flats on the Craven Close estate shot from Clapton Common. Another shot with Rookwood Court in the background. A shot from the rear of a Craven Close block of bungalows on the estate behind and below including a woman resident shaking out a large rug, the terrace houses in Castlewood Road are visible in Background. 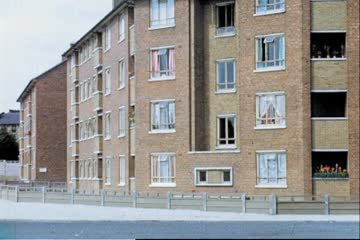 Shots of balconies on the Craven Close block. I recognise the next two small blocks of flats after the film of Rendlesham House. The first one is 19-25 Walsingham Rd E5 and the next one is Mildenhall Rd E5 at the junction with Chatsworth Rd E5. Hello there. Could you please send me this film so I can show my Grandmother. she grew up in this block and I think she may be in the clip! Many thanks, Jordan.